Gluck as a symbol of the Austrian influence on French politics. In her interesting paper A Lady-in-Waiting's Account of Marie Antoinette's Musical Politics. Women, Music, and the French Revolution Rebecca Geoffroy-Schwinden touches a few fundamental subjects on Marie Antoinette and the French Revolution context, that may help in better understanding the social and political environment, within which both a young von Mozart and a much cherished von Gluck and his pupil/protegé Salieri had to promote and perform their works. 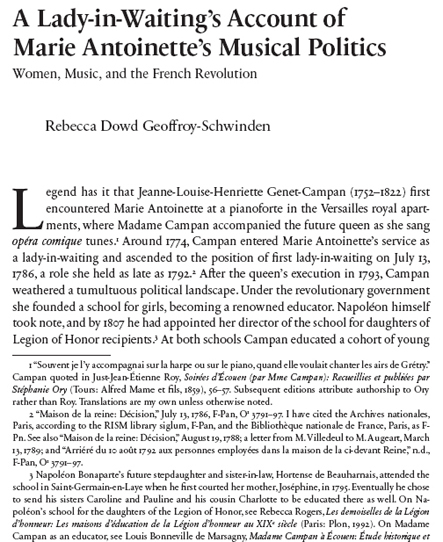 The paper is divided into 5 sections (Foreign Taste; Exclusivity; ExtravaganceA Musical Legacy; Music, Pedagogy, Politics), through which the story of Madame Campan (1795-1822) unfolds from her role at the French Royal Court (at the direct service of Marie Antoinette also as pianist and harpist) to the French Revolution up to her career as education leader for young ladies of important families (among them that Hortense de Beauharnais, stepdaughter and sister-in-law of Napoléon I, later queen of Holland and mother of Napoléon III). As is well known, Mozart miserably failed to establish his professional activity in Paris in 1778, while Gluck was already the great personal protegé of Marie Antoinette in Paris and the very symbol of the influence of the Austrian politics on French political choices. Mozart, in his letters from Paris, reveals all his loyal faith in the Austrian Emperor Joseph II, brother of Marie Antoinette, even though his patron in Paris supports the German/anti-Austrian politics (sic!) and then supports the party of Piccinni against that of Gluck. As Geoffroy-Schwinden points out, there's a precise political meaning behind such type of musical choice in Paris: if you choose Gluck, you choose Marie Antoinette and Austrian influence; if you choose Piccinni, you choose Madame du Barry against any Austrian influence on France, Austrian influence due to the much ill-fated 1756 friendship treaty between Austria and France... It seems that, despite this strong political exploitation of music typical of the France of this period, Gluck and Piccinni, instead, were in reality of personal friendly terms. But Gluck is just the first of a long series of musical/political wrong choices (i.e. mistakes) by Marie Antoinette, which will eventually lead the French Queen to lose the support of the many groups of the political scene of French nation, both before the Revolution and during that. A few mistakes: despite being a great music lover, she is a poor musician herself and, moreover, rejects all the other forms of art (i.e. painting, literature, etc. ); the organization of night music serenades at Court with wind instruments bands proved disastrous to her own personal reputation (with some serenade lasting also from 11 p.m. to 3 a.m.); she admits professional music composers to her strict personal private circle of close friends, people such as Gluck, etc. ; her presence at Court during the performance of Grétry's aria Ô Richard, ô mon roi (considered loyalist and royalist by the Revolution authorities) or, instead, of Monsigny's Peut-on affliger ce qu’on aime? became a major point of accusation during the trial which will determine her death by guillotine in 1793; she loves opéra comique and bizarre ballets and pantomime-ballets; she loves grand-opéras which require a great amount of money to be organized and performed, etc. Still a considerable enigma remains the support given by her brother Joseph II and by herself, Marie Antoinette, to the anti-aristocracy and liberal activities of Beaumarchais and in particular to his theatre plays such as Le Nozze di Figaro (banned by Louis XVI against the will of Marie Antoinette) and, especially, to that so radical opera libretto for Tarare with music by Salieri (Paris, 8 June 1787). If we think that Beaumarchais was a well known French spy, who had a fundamental role in his working for the Independence of the United States and in gaining the support to the American activities from the French government and from the King of France Louis XVI, and that Prussia and the German nations were trying to create difficulties to the interests of Austria with its planned western expansion towards the Rhineland and France, probably we can see in that activity of support a complicated Austrian political operation against Prussia and German nations (and England) interests both in Europe and in America. Nonetheless the musical choices of Marie Antoinette in Paris had their own merits: not only the well deserved diffusion of the operas by Gluck in France but also the recognition, by the music professionals, of the high level quality of particular types of violins like the Amati ones (already a tradition at the French Court and beloved by Marie Antoinette) and, especially, the Stradivari ones, promoted by Marie Antoinette's favourite violinist at Court, Giovanni Battista Viotti, at her personal musical service since 1784. Campan uses the example of Marie Antoinette (and especially what were considered her political and social mistakes) to teach her own pupils (all from the great noble families of France) how a well-prepared noblewoman must do and must avoid, when women's choices in art and in music can be easily considered dangerous symbols of a clear political position... Campan's education masterpiece will be Napoléon I's stepdaughter Hortense de Beauharnais, the mother of emperor Napoléon III.